Hello and welcome everyone to this edition of Graps and Claps, this time taking me to the Brixton Recreation Centre for Rev Pro’s big Global Wars UK show with the main event rematch for the Undisputed British Heavyweight between Minoru Suzuki and Tomohiro Ishii (a proper 2 dads in a car park match). Early start for me to get down to London with a 50 minute bus from Rochdale to Manchester, followed up with a 2 and half hour train/tube trip to Brixton, arriving in what is an upmarket area of the nation’s capital but on this impression with the wafting smell of fish in the air and a grey and miserable day this wasn’t the upmarket area that it was supposed to be. Only one boozer we visited here was a branch of the Craft Beer Co located near the Beehuve Wetherspoons. A mixture of 20 beers on tap either keg or cask plus a number of cans were on sale as well, the decor inside this pub was akin to an american diner of sorts with bright flashing boards and red leather seats. A good 2 hours was spent in here meeting up with a number of wrestling luminaries including The Indy Corner’s JP & Joe, whilst also looking outside at Mark Davis walking past in his socks and sandals – whoever thought this look was going to come back into fashion, but I’m not going to argue with Dunkzilla’s fashion sense. 4 pints in here were mainly IPA based with the £5.40 Siren Brewery IPA being the best of the pints I had, when visiting here do expect to pay anywhere from £4.50 to £8 a pint but in all honesty it is maybe the best place for a drink near the venue. With the time coming up to 345pm, our group decided to make our way to the Brixton Recreation Centre which was only round the corner and up one flight of stairs. 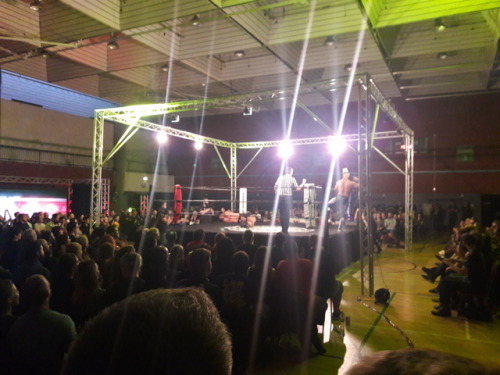 This venue was in all sense and purposes a gym hall with bleacher seats on one side which were instantly filled, so what was supposed to be a seat for the evening ended up being a standing spot for the duration of the 3 and half hours. Beer in here was a bit of a shambles with long queues of up to 15 minutes at one stage – our Geoff missed all of the second match thanks to this occurrence. Once they worked things out it did improve but it did feel all a bit like ‘spoons with one serving behind the bar – if you cant handle pulled beer, just get cans in – its so simple! Anyways rant about the £4 beer over with, lets get into the action with a big 9 match card that opened up with the current IWGP Jr. Champion Kushida taking on Kurtis Chapman who was replacing David Starr who was stuck in air limbo due to the airline company going bust but not notifying there passengers – complete shithousery on there part. So with Chapman taking Starr’s place we got down to action with an early feeling out process which Kushida got the upper hand of. A feature of the evening was the at times apathetic crowd that didn’t half need a bit of geeing up from my stamping right foot, no wonder I have been walking like John Wayne today. Despite the quiet crowd this was still a passable match with Kushida looking the best out of the two as he finished off Chapman in around 10 minutes with the Hoverboard driver for the 3 count. To be honest even though he took the match at short notice I didn’t think anything stood out about Chapman, that a Josh Bodom could have maybe done a better job as a replacement but hey ho I digress. Next up was an interesting Tag Team tussle between Ringkampf (Walter & Timothy Thatcher) vs L.I.J (Sanada and EVIL). Surprisingly there was a lot of offence against the Ringkampf boys especially on Walter from EVIL making the Austrian look vulnerable in comparison to his New Japan counterparts. Ringkampf eventually did come back into the match locking in duel sleepers on both Sanada and EVIL but they both managed to escape the Ringkampf duo’s grip as they sent Walter packing to the outside, meaning that Thatcher was left all alone to be hit with the Magic Killer by EVIL and Sanada to get the big victory here in what I could count as a shock. Match No.3 we had the arrival of Lord Gideon Grey who I haven’t seen for ages since the whole feud with Grado and Colt Cabana a couple of years ago. Grey was here to introduce the match up between his Legion of Lords tag partner Rishi Ghosh whom he has recently had issues with at the most recent Cockpit show, his opponent was The Great O-Kharn who has been on the old Wayne Rooney hair growth programme – a proper mound of curly hair. This was certainly a diversion from the fast paced New Japan feel but with a great bit of storytelling in between the ropes with Ghosh playing the plucky underdog against Grey’s new charge O-Kharn who is currently undefeated and has visibly improved his ringwork since the last time I saw him at Altrincham vs Danny Duggan which was a total dud. Ghosh managed to crawl out of O-Kharn’s claw hold/slam to fightback but as the referee wasn’t looking, Lord Gideon whacked his former best friend around the head with a cane to knock him loopy leading to O-Kharn to hit a reverse neck slam to get the three count, cue more ring announcing stylings from Gideon – I surprisingly enjoyed this match and well above my expectations. 4th up we had the clash between Chris Brookes and L.I.J’s leader Tetsuya Naito who came out to a great reaction from the Brixton crowd. Early on Brookes fainted Naito to the outside by doing Naito’s pose which only riled Mr. Naito who came in to kick Brookes in the shoulder to stop these shenanigans. Brookes give him his due performed admirably against one of New Japan’s big stars and he nearly picked up the shock victory with a Jay Driller for a 2 count, as Brookes was looking to finish things off he got laid out with not 1, but 2 Destino’s from Naito who picked up the win in 11 minutes. A solid match but Naito was in house show mode for me wearing his T-Shirt for the duration of the match (come on Naito you have a better body than my fat arse). Intermission Main Event with my dad’s favourite wrestler Zack Sabre Jr. taking on Former NEVER Champion Hiroki Goto. It was during this I found that the current NEVER Champion is Taichi – christ almighty they must be running out of options 😞. Lots of strikes and submissions in this one folks with ZSJ looking really good in the process and I would say he was quite dominant over his much larger oppponent, one thing I love about Zack are the countless transitions from hold to hold, he is just so fluid as an operator in the squared circle. Despite trying his best to submit Goto, Zack put away Goto in 15 minutes with a reverse bridge pin for the victory as he looks on his way to facing maybe EVIL or Naito in the futute, the Naito match could be a barn burner in my opinion. Half time break of 10 minutes which stuck to the schedule, we returned with Mark Davis taking on Satoshi Kojima who as we have found out he has gained a great respect for bread of all things – I just can’t imagine that Kojima has some Blackpool Milk Roll in his bread bin. A hard hitting 10 minute match with many clotheslines and forearms in the ring corner by both men but it was Kojima who got the best of things as he hit the rapid fire chops in the corner to Davis to make his chest look like corned beef. Not long after that Kojima finished off Davis with the cozy lariat for the victory and as you may say – the breadwinner for the evening. 7th match up was between El Phantasmo taking on Rocky Romero in what I felt was a bit of a comedown match before the two what would be best matches of the evening. Early dives from both Romero and ELP were hit but when the action got back inside it was ELP who got the better of things as he put away Rocky Romero with a splash/moonsault combo to pick up the impressive victory, but in hindsight this match maybe could have been scrapped just to add a few more minutes elsewhere on the card. 8th match up was an anticipated contest that I was looking forward to seeing with Will Ospreay taking on Chris Ridgeway for whom it was great to see him getting this opportunity high up on this card. As expected this duly delivered as Ridgeway tried to use many strikes to wound Ospreay but Will was more than his match as his ground game is greatly under appreciated as people still think of Will as ever the high flyer. With the match coming to the boil, Ospreay looked to hit the Oscutter to Ridgeway but he was caught with a sleeper choke by Ridgeway to cause the tapout victory to end a belting match. After the match Ospreay had to be carried out as he picked up an injury during this contest, as Ospreay went to the back Josh Bodom came out to attack Ridgeway to possibly set up a match between them two in the future – Bodom bodywise looks amazing fantastic shape that hasn’t been anywhere near the Holland’s puddings. 8 matches, it is now time for your MAIN EVENT and what a main event this was for the Undisputed British Heavyweight Championship between Minoru Suzuki who is the title holder taking on Tomohiro Ishii. Once the singalong to Kaze Ni Nare had ended we got down to business as both Ishii and Suzuki both got into forearming each other really hard and Suzuki hitting some of the hardest chops I have ever seen – these made Walter’s chops look like tummy tickles. The action spilled to the outside to the merch desk and both also had a chair battle in which Ishii came off the worst but he did manage to beat the count to continue the match. With Suzuki on top, he even had time to give me a death stare telling me to zip it from clapping and stamping which elicited a OOOOOHHHH from the crowd as I shat myself. Suzuki who as I said looked well on his way to victory, got a bit to complacent by not puttong away Ishii and he got duly punished for this as Ishii hit the match winning brainbuster to Suzuki in 24 minutes to end an amazing match and for me easily in my top 5 matches of the year – check this out on the VOD ypu won’t be disappointed. Show done it was time to leave the venue diwn the ultra wet stairs and say our goodbyes to everyone in our group who were all great company – always good to see JP and Joe and Grappl app creator Gareth, you should download the app from the play store to see what it is about. Overall as a show this was very good if only for the last two matches which I whole hearteadly recommend that you watch. The downpoints though were maybe too many New Japan victories once again with Kojima and LIJ getting wins over talent that should be pushed to the hilt in Rev Pro in Ringkampf and Mark Davis. With the early finish at 7:15pm, I managed to get the earlier train back to Manchester to arrive back in Rochdale for 11:20pm to rest my aching limbs before going to work in the morning. I hope you have enjoyed reading, any feedback and comments are welcome and I will return next with a review of Futureshock Wrestling from Prestwich this Saturday, so until then – BYE! !